15 sounds like a solid number, right?? Well, technically I'm 15 weeks & 4 days. But about a month from now, we'll know whether little Baby C is a boy or a girl (19 weeks)! I'm totally thrilled to know what it is, because frankly I'm tired of calling our baby an "it" & also, I just want to buy things for him or her. So because I said I wanted to document stuff more, I decided to do a 15 week update. According to my 2 baby apps, Baby C is the size of a navel orange OR a hass avocado which is about 4.5 inches, 2-3 ounces. Not sure if that has any significance or importance to you but it puts things in perspective I guess (haha!). One of the apps that I have though is cool because it has the size of Baby C's hand right now. I love seeing it grow! I'm feeling great. Is that crazy? People keep asking me "How are you feeling?" like I should be feeling horrible. Maybe I'll feel bad later or maybe a future pregnancy will be worse, but so far this one has been pretty awesome. I'm tired, like all the time, but I'm pretty confident that's normal. I mean, I'm growing a human being for crying out loud. Also, my back hurts every now & then if I stand or move around too long.. But other than that, I think I'm in good shape. I love food. Always have, always will. I had some nausea in the first trimester, but none so far in the second. I don't really think I've had "cravings." Things just sound better than others to me which I feel like that's the way it's been my entire life & how most people are. Mexican food may be the one potential craving I've had. The only way I figure that is because I keep suggesting it anytime we go out to eat. And if you know Andrew, he's totally thrilled with me suggesting Mexican food all the time. No, I'm not in maternity clothes yet. My baby bump is JUST starting to form. Which I feel a little self-conscious about because I feel like I should have a bigger bump than I do. I've always worn loose fitting clothes because I hate when things are tight on me. So I think I'm going to be able to fit into all my clothes (with the exception of pants) for a good while. In my head (which may not be reality), I think I may be able to get away with not buying anything labeled "maternity" except for jeans & shorts. Who knows, maybe this tiny bump will be gigantic by the end of this summer. Until then, no, I'm not buying maternity clothes. I don't want to spend the money until I have to. Andrew is awesome. He's super excited for our baby to arrive. He's made sure to take good care of the two of us (Baby C & myself). Andrew & I are both anxious to find out the gender of our baby next month. Andrew thinks it's a girl. I think it's a boy. From our friends & family, we've had mixed reviews on the topic of who thinks it's going to be what. Either way, I'm totally content with what Baby C is. My mom has been great to check on me & help me with stuff (she's absolutely thrilled to be a grandma!). And all of my friends have been there to support & love on me. I've got lots of people giving me helpful tips & advice. Most of the advice I've really taken into consideration &/or listened to. So more advice is openly welcomed. And if I think your advice is lame, I probably won't tell you, so no worries to you ;). With all of that being said, I'm super thankful for my close family & friends.. Andrew & I are both only children so our children won't have aunts, uncles or first cousins. I have plenty of honorary aunts & uncles which makes me happy. And I'm super thankful for all of those wonderful people who will claim Baby C as their own family member even if it's not related by blood. 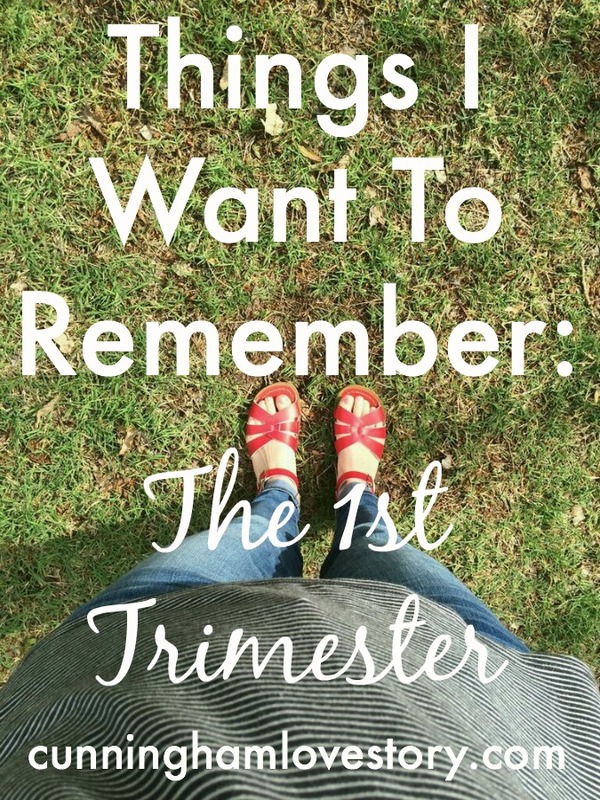 I can't believe it, but the first trimester has already come & gone. Many people are shocked when I tell them how far along I am.. "How could you keep it a secret that long?!" Let me tell you, it was hard. But I know it was so worth it to make sure this little human inside of me was healthy & safe before we told the whole world. I've not done a very good job "documenting" this pregnancy. Since it has been a secret for so long, I've simply forgotten to do things because I was trying to keep it on the down low. But I'm going to try to be better to write things down (or blog) & *hopefully* try to remember to take more pictures of my growing belly-- which is something I don't really want to share with everyone (at least not a weekly pic! ), but mainly for myself to have. I also want to have things written to show my sweet child someday. Maybe they will think I'm pretty cool for that, or at least maybe they'll think that until they're a teenager & I'm no longer the cool mom. So with that being said, here is my first list of things I want to remember. -February 8 was one of my favorite days so far. It's the day I found out about my sweet baby. -Two weeks after that was when I experienced my first wave of nausea.. Which I didn't know how to cope with or control at the time. 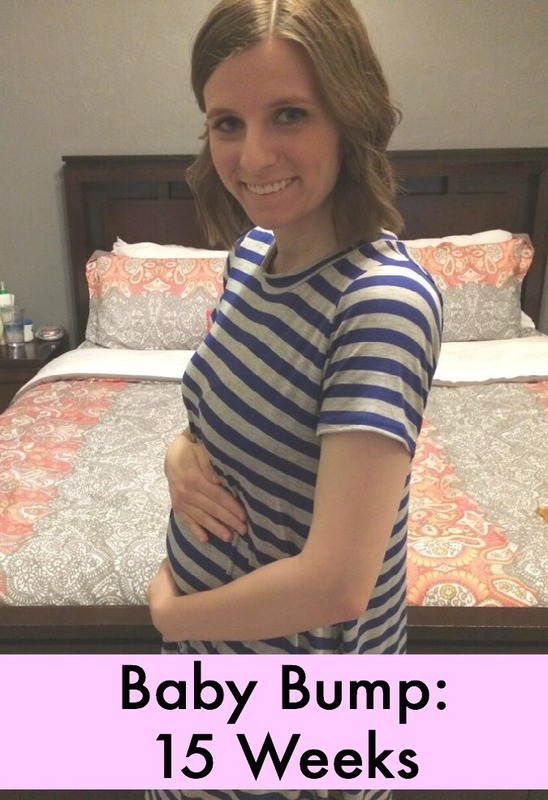 With a little help from Google & my handy-dandy pregnancy book, I discovered saltine crackers. Eating those & then staying in bed an extra thirty minutes after I ate them helped tremendously. -We had a little scare which made me realize how much I already love this baby. 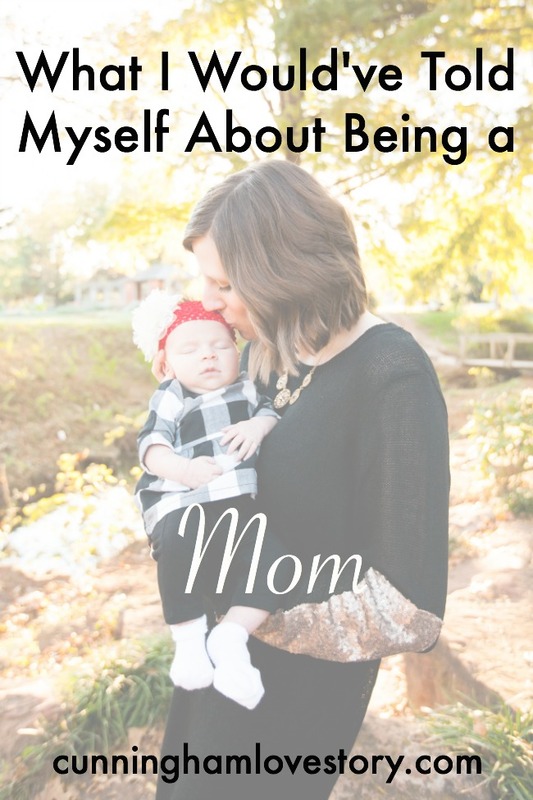 As I was experiencing some things that were unknown, God gave me an overwhelming peace & a quick realization that this was my first "motherly" experience, worrying about the safety & health of my child. -March 1, aka Super Tuesday, was the day Andrew & I got to see Baby C for the first time. Of course, he or she looked like a little frog at the time, but soon enough we'll get to see they're precious little face. -April 6 was the day we got to hear Baby C's heartbeat for the first time. Literally, a breathtaking moment I'll never forget. Guys, I'm already so in love with this tiny human. I'm so excited to meet him or her. I have an undergraduate degree in Child Development. I have babysat the majority of my life. I have worked with children since before I can remember. I volunteer at a place that works directly with children under 4 years old. 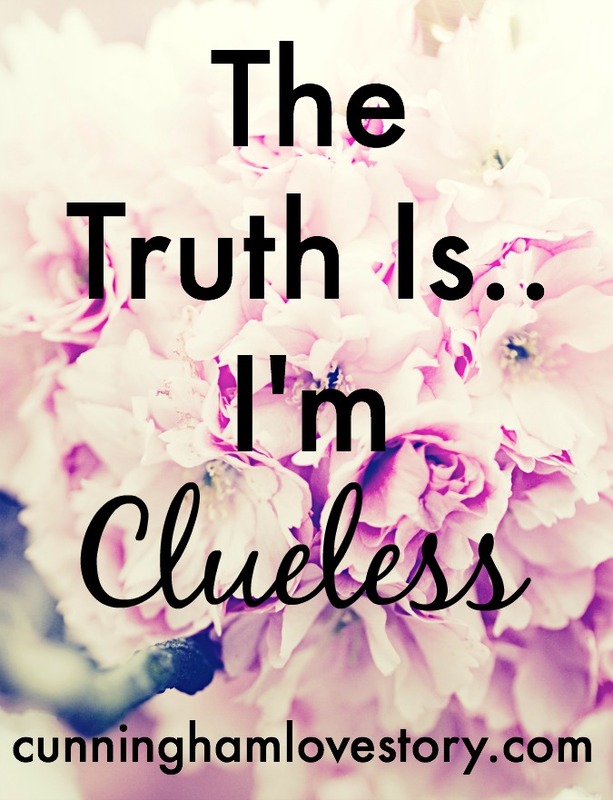 And yet, I'm clueless. I'd be lying if I said I'm totally prepared for the journey ahead. I've read all of the books. I know how to interact with my child. I know how important reading to my child is. And I know all about "safe sleep." But yet again, I'm clueless. I'm clueless in the fact that I don't know how to birth a child. I don't know what it's like to feel my baby move yet. I don't know how to nurse. I don't know what a contraction is like. I'm terrified of labor. I don't know how to pump. I don't know how to bathe my child. Like I said, I'm totally clueless. I'm not worried I'll be a bad mom. I'm not worried that I'll mess my kid up. I'm not even worried that I'll make a bad decision. But everything is just so unknown. I know a lot of women who are pregnant "hate" when other women give them advice. And maybe I'll get there one day. But right now, I want to be informed. I want to know all of the motherly secrets out there. I want women to tell me how labor was for them. I want women to tell me what it feels like to have your baby move inside of you. I want women to give me nursing tips. I mean, someone please tell me, DO THOSE BODY PILLOWS WORK?? Clearly Andrew & I will make personal decisions on pregnancy, birth, parenting, medical care, etc. for our baby. But I'm all about hearing informative & helpful advice from all of you mommas out there (especially if you've done this thing within the last decade!). So comment, email or if we're close, text me. I'd love to hear anything you have to say. Seriously. Advice is welcomed. (Pinterest has currently been my advice-BFF lately.) Thank you. 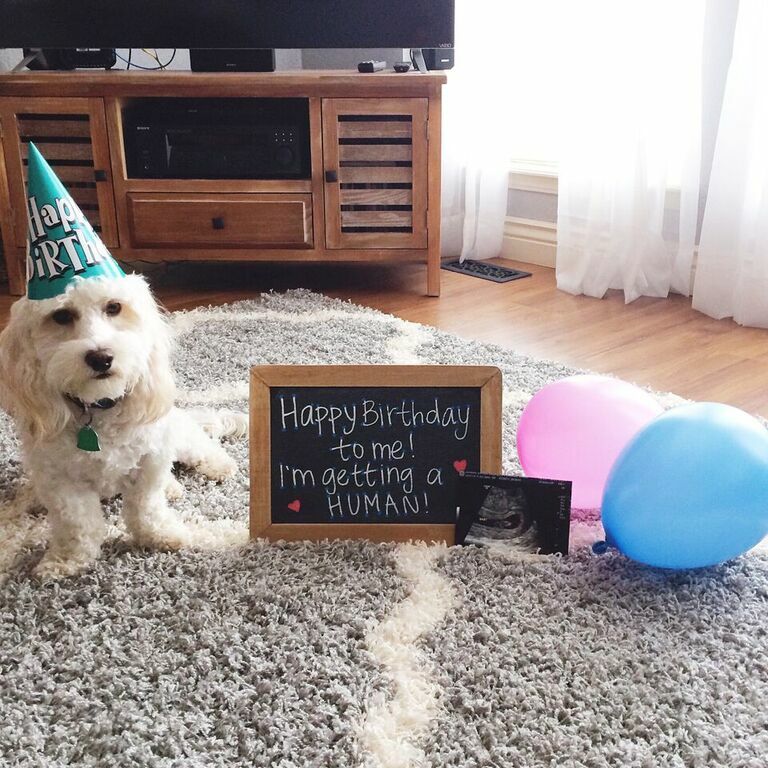 If you follow me on social media, you may have seen that my dog, Murphy, had a little announcement on his birthday yesterday. In case you missed it (or maybe want to see it again because it's the cutest), here it is..
THAT'S RIGHT. Our family is growing! We couldn't be any more ecstatic! So since I've kept this secret for what seems like forever, I wanted to share with you all some of the details. I found out in early February that I was pregnant. Andrew & I wanted to wait to tell people that we were pregnant to make sure everything was okay with the baby. The odds of having a miscarriage drop dramatically after the first trimester. Since we found out, we have been to two appointments. The first appointment, we got to see Baby C for the first time on an ultrasound! And the second appointment, which I had last week, we got to hear Baby C's heartbeat for the first time. Both of these appointments have been very special to us & I'm so glad Andrew was able to be there with me for them. So we've kept this big secret to ourselves for a while. We decided it was time to share it with the world. And we're expecting our sweet baby sometime around October 16! I haven't blogged much lately because all I can think about is this human being growing inside of me. So I've got a lot to say about this baby & I'm so excited to share it with you all. Hello again blogging world! It's good to finally see you since it's been a while. I've been currently running at the speed of light, that's why you haven't seen me much. But today, I'm back. When you blog & then don't for a while, it's really hard to "find your voice" once again. So the first thing that popped into my mind when I started typing this was to tile it, "Life Lessons By Sar." Some of you may not know that I talk to myself-- often. I blame it on the fact that I'm an only child & needed a friend when I was growing up. 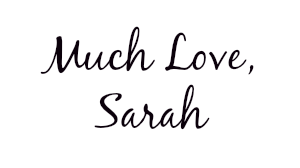 So when I talk to myself, I refer to myself as "Sar." 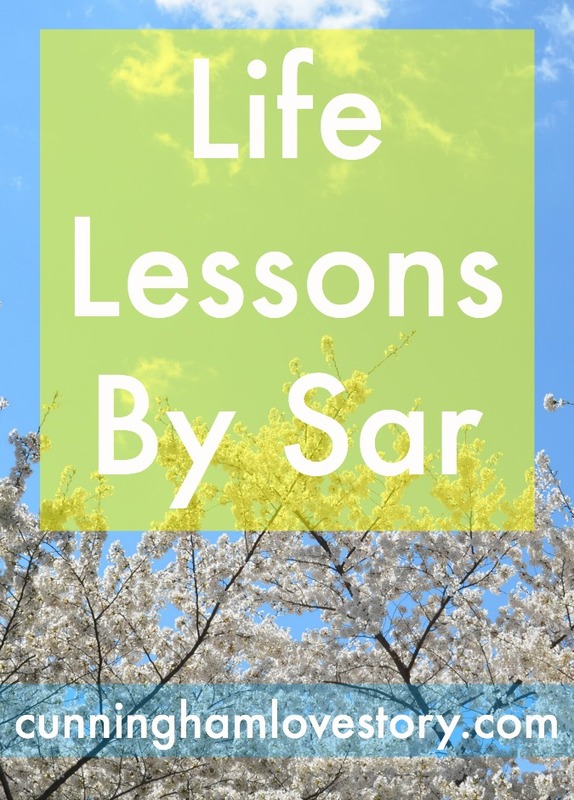 And there you have it-- Life Lessons By Sar. Since I've been running at the speed of light, here are some life lessons that I've learned recently. I know Oklahoma is known for having some of the worst allergies in the country, but seriously my allergies have been worse than ever this year. I think I sneezed 1,209,367 times on Saturday alone. That might be an exaggeration. But nonetheless, Flonase has been my BFF these days. When online shopping, don't just assume that a "discount website" is truly the lowest discount you can get. I've found this out a lot lately. Story #1: I get emails every day from jane.com & delete the majority of them. But some days I scroll through to see if I should blow my money on something I don't need from them. Well I saw they had a deal for the famous "Volcano" candle that's clearly every blogger's favorite. I clicked on it & found out to my surprise that I could buy it from Anthropologie, I repeat, ANTHROPOLOGIE (aka the most expensive store on the planet) cheaper. Turns out, jane.com removed that deal because people complained. And being the savvy shopper that I am, I knew that they were about to rip a ton of people off the moment I saw the price. Story #2: Andrew & I have been trying to find a new area rug for our living room because the one we bought when we first got married is just too small. So I've been looking around for a while to try to find a good deal on a stylish rug. I found one I really liked on Wayfair & was seriously about to purchase it when I decided to browse around none other than....... Walmart. And if anyone knows me, I utterly despise Walmart (Target is my main squeeze). But while I was surfing Walmart's rug section on their website, I found the EXACT SAME RUG that Wayfair had for over $60 less. Holy guacamole, I bought that rug from Walmart faster than you can say "Mississippi." So bottom line, don't always trust discount websites (even Amazon!). Life is better with a clean house. I hate cleaning, but I love it after I do it. Everything smells better & I feel like the world (or maybe just my home) is a better place. A cup of coffee a day keeps the doctor away. I don't really know if it's true, but all I'm saying is that if I live to be 110, you all will know that's how I did it. Cuddling with a dog = Fulfilling life. And there you have it folks. A few life lessons for your Monday. Have a great week! Do you have any life lessons you'd like to share?